Painting walls, floor and most of seven sculptural tableaux a medium gray, Pictures Generation artist Barbara Bloom transforms David Lewis into a monochrome stage set, echoing the vintage black-and-white photographs of actors and literary figures that constitute the starting point for each of her works. In Foursome, an image of Marilyn Monroe, Arthur Miller, Yves Montand and Simone Signoret, drinking wine in a hotel bungalow in 1960, hangs behind a small round billiard table with four unevenly spaced goblet-shaped glass pockets. A gray felt mat frames the picture and the same fabric covers the table, against which four glass pool cues with mirrored tips lean precariously. 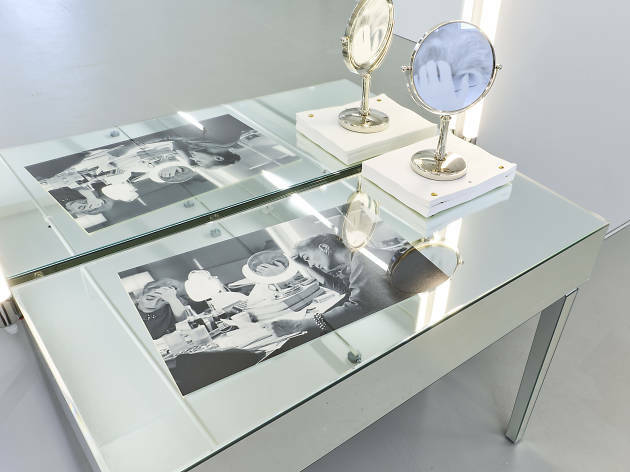 Abstractly rhyming with the photo, the table suggests that the romantic relationships among the stars of stage and screen in the photo, intimated by their glances at one another, are a contest of strategy as well as chance. Bloom’s ruminations on a trivial moment of Hollywood history envision desire as a game of brittle self-regard. Vanity begins with a 1959 publicity shot of a middle-aged Joan Crawford reflected in a pair of mirrors as she read scripts at her dressing table. 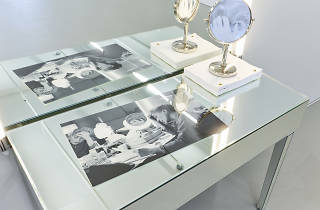 Bloom re-creates the setup, embedding the photo in the top of a mirrored table holding a smaller mirror etched with Crawford’s fragmentary image. Image and reflection ensnare each other—and the viewer’s likeness—in a web of reality, artifice and self-presentation.